We went to a flea market today to look for vintage silk and for something we would like to own. The expedition was a success; we bought a bunch of wonderful vintage adras and atlas (silk fabrics with ikat pattern) for our Etsy store. As for nice vintage finds, we bought a couple of books with beautiful pictures for our kids (my sister and daughter), I found a very old Dulevo egg-cup with a saucer and a wonderful tea box, and thought the day was successful enough and we could leave. And then I saw an elderly lady who looked like she came from a village. She was selling old things which looked useless to me, but something caught my eye. It was a doll - a handmade doll, very primitive, with a lovely face and many plaids - a traditional hair style for Uzbek girls. 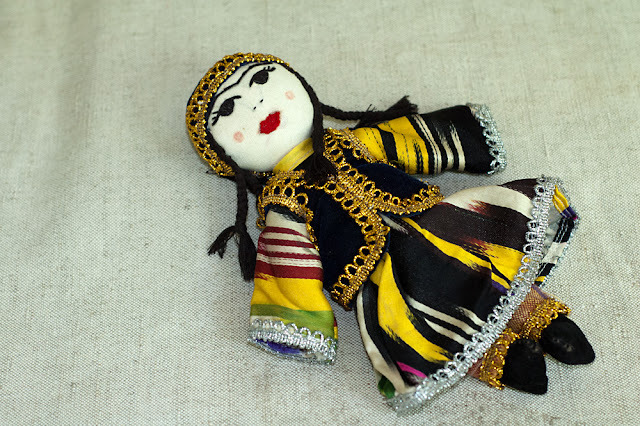 The doll reflects the traditional concept of an Uzbek beauty: she has a round face with large almond-shaped eyes ('like stars or like doe's eyes), bow-shaped eyebrows ('they send arrows through hearts), red mouth ('like a red rose') and pink cheeks ('peache-like'). All the attributes are there. And her costume is fully appropriate and is in line with traditions - a khan-atlas (ikat patterned silk satin) dress with pants (lazim), a velvet vest and a hat. And, of course, traditional footwear - kaushi or ichigi. My heart was broken. The lady saw I was hesitating and said: 'This was mine. Many years ago my own Grandmother made it for me. Then I grew up, got married and took it with me to my husband's home. I wanted to give it to my daughter, but I only had sons. And now my granddaughters would not play with it - they say it is for poor children. They only want toys from stores. I would prefer if you could buy it and take home with you; I do not want to throw it away'. I was toying with the doll when I saw something interesting - a little piece of embroidery showing from under the old clothes she was offering. I dug it out and gasped. It was the loveliest, prettiest, most wonderful girl's hat I have ever seen. How can I describe it? I am at a loss for words... so I will try to be specific first. It was a traditional scull cap or hat called dupi (Russians living in Uzbekistan call it tubeteika). These hats fold flat and can be stored easily. Girls and women wear them with traditional clothes. 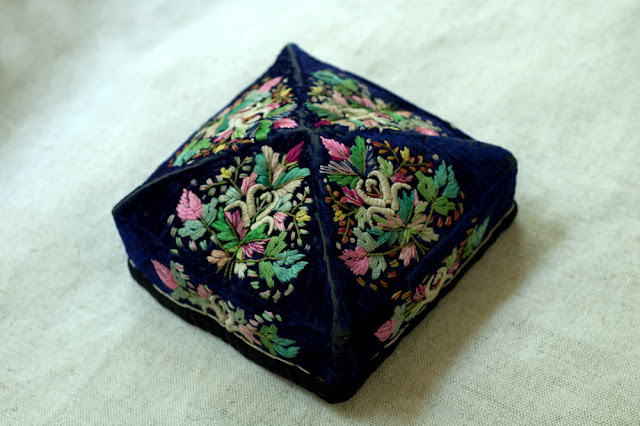 This particular dupi was made for a very small girl, possibly 3 or 4 years old, of navy velvet all covered with the most beautiful embroidery. It belonged to this lady when she was a child, and then she kept it in her chest with that doll for all these years. And now I cannot write anymore. I just have to show it. It might be funny but I almost cried when I saw it. 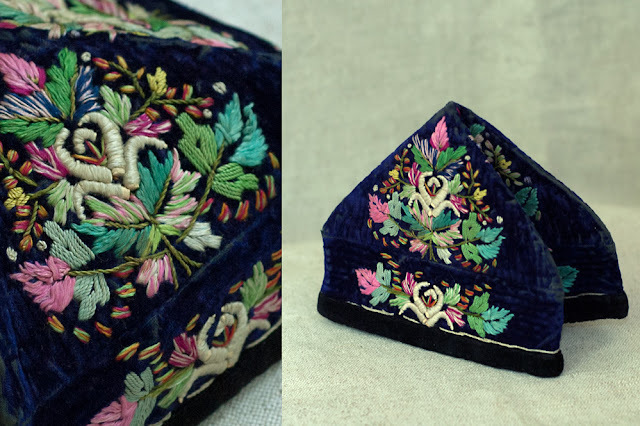 It is so lovely and so touching, this little hat that was owned by the woman sitting in front of me, when she was a little girl, many years ago. Now she is old - our women in rural areas live a hard life - and the hat is still beautiful... Of course I took it home, along with the doll. I paid her more than she asked for and left quickly, as I did not want to start crying right there. And here I shall stop. The things are mine now and are not going anywhere. The doll is wonderful! The hat is very cute! Hi DaisiesCrochet! Thank you! You have a lovely blog, I will follow it - I am interested in good knitting patterns. Oh, I'm so jealous! :) The doll is very cute and I love the tubeteika! Thank you for your postings! Inessa, thank you for sharing my joy!